Pervasive computing will introduce hundreds of computing devices per user. This change is of such magnitude that it is qualitative as well as quantitative. Old solutions may not scale when the size of the problem grows by such a factor—passwords, for example, will no longer be a suitable user authentication method. In this paper we examine new security issues for pervasive computing including authentication, biometrics and digital rights management. But the potential impact of pervasive computing on society is such that we have a responsibility to look further than just the technical issues. Frank Stajano. Security for Ubiquitous Computing. John Wiley and Sons, Feb 2002. ISBN 0-470-84493-0. http://www-lce.eng.cam.ac.uk/~fms27/secubicomp/. Ross Anderson and Markus Kuhn. “Tamper Resistance-A Cautionary Note”. In “Proc. 2nd USENIX Workshop on Electronic Commerce”, 1996. ISBN 1-880446-83-9. http://www.cl.cam.ac.uk/~mgk25/tamper.pdf. Oliver Kömmerling and Markus G. Kuhn. 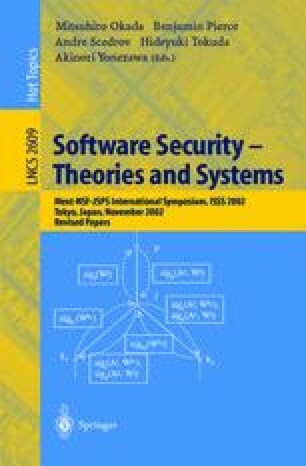 “Design Principles for Tamper-Resistant Smartcard Processors”. In “Proceedings of the USENIX Workshop on Smartcard Technology (Smartcard’ 99)”, pp. 9–20. USENIX Association, Chicago, IL, 10–11 May 1999. ISBN 1-880446-34-0. http://www.cl.cam.ac.uk/~mgk25/sc99-tamper.pdf. Michael Roe. Cryptography and Evidence. Ph.D. thesis, University of Cambridge, 1997. http://www.research.microsoft.com/users/mroe/THESIS.PDF. Lisa Thalheim, Jan Krissler and Peter-Michael Ziegler. “Body Check: Biometric Access Protection Devices and their Programs Put to the Test”. c’t, 11:114.., 22 May 2002. http://www.heise.de/ct/english/02/11/114/. Originally in German, but translated into English at the URL provided. John Gilmore. “What’s Wrong With Copy Protection”, 16 Feb 2001. http://www.toad.com/gnu/whatswrong.html. Originally posted to the mailing list cryptography@c2.net on 2001-01-18 in response to an invitation by Ron Rivest. Ross Anderson. “dTCPA / Palladium Frequently Asked Questions, Version 1.0”, Jul 2002. http://www.cl.cam.ac.uk/users/rja14/tcpa-faq.html. Richard Stallman. “Can you trust your computer?”, 21 Oct 2002. http://newsforge.com/newsforge/02/10/21/1449250.shtml?tid=19. Also archived at http://www.gnu.org/philosophy/can-you-trust.html. Philip R. Zimmermann. “Testimony of Philip R. Zimmermann to the Subcommittee on Science, Technology, and Space of the US Senate Committee on Commerce, Science, and Transportation”, 26 Jun 1996. http://www.cdt.org/crypto/current legis/960626 Zimm test.html. Andy Ward, Alan Jones and Andy Hopper. “A New Location Technique for the Active Office”. IEEE Personal Communications, 4(5):42–47, Oct 1997. ftp://ftp.uk.research.att.com/pub/docs/att/tr.97.10.pdf. Also available as AT&T Laboratories Cambridge Technical Report 97.10.